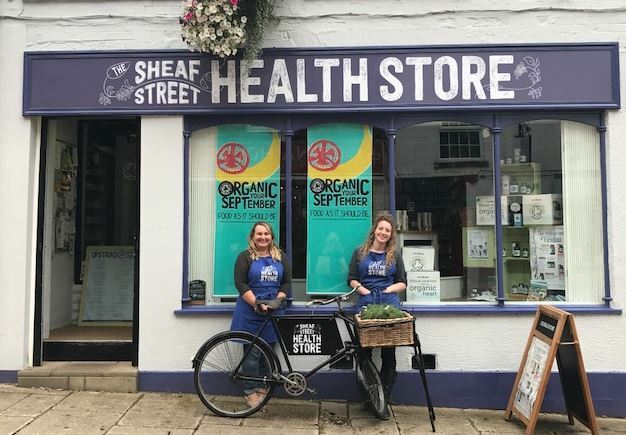 Our very own Group Sales Manager Natalie Howlett was lucky enough to be invited along to visit the popular Sheaf Street Health Store in Daventry, Northamptonshire. Founded in 2016 by husband and wife team Shaun and Cheryl, Shaun is well-known in the Daventry area for his passion for triathlon and Cheryl has 30+ years experience in the natural products sector, having launched Viridian Nutrition in December 1999 – she knows her stuff. Sheaf Street Health Store is a specialist independent health and wholefood store with experienced and qualified advisers on hand to signpost you to the right information and dietary programme. The new hub provides all things healthy, natural, organic, ‘free-from’, vegetarian/vegan, nutritious and foodie. In-house vegetarian and vegan recipes are created, tried and tested in store using the products that they sell so you never have to worry about searching endless supermarket shelves for said ingredient. With their very own demo kitchen in store, you can learn the perfect way to prepare nutritious healthy meals – I hear the quinoa and roast red pepper soup is particularly exceptional. But here’s the best bit, not only is the store filled with delicious aromas as you browse, upstairs you will find Yoga and soon to be Pilates! Shop until you drop and participate in some Yoga. Shaun and Cheryl are passionate and excited for the future of Daventry so pop in and say hello, time it right and you just might be in time for tea testing! Support your local independent health food stores.